Can you perform card effects with kids? Yes you can! Barry has studied the world as far back as Columbus and he is thinking FLAT (Fun Laminated Attractive Treasures). He has created decks of fun card magic with kids. 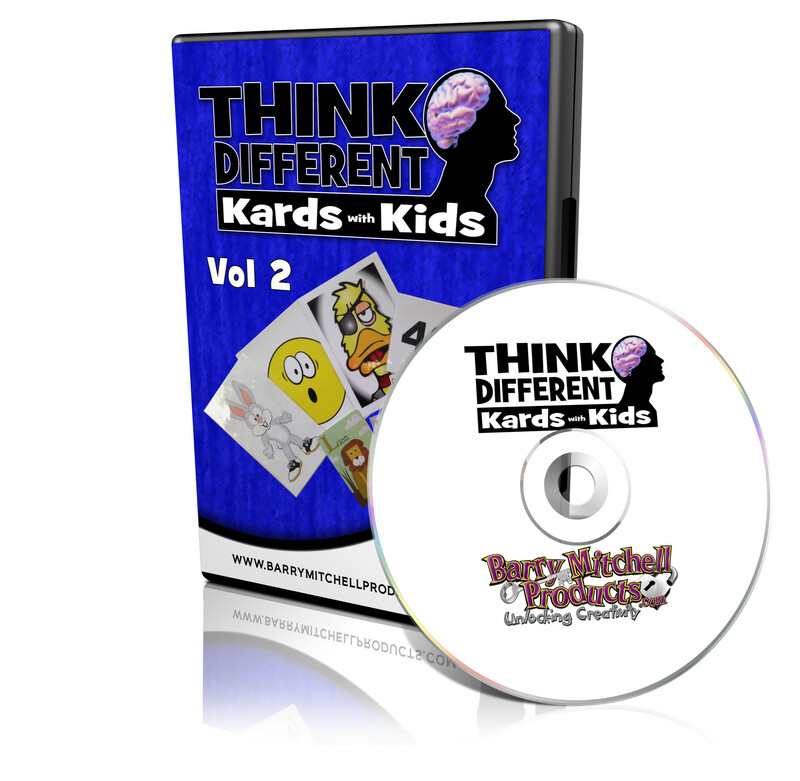 Not every card has to be a playing card.Dig deep into a pile of pasteboard presentations, lasting laminates, and a fountain full of forces; so you’ll discover the magic of Kards with Kids. There’s so much content Barry wanted to cover that it took TWO DVDs to contain everything. PLUS the artwork is included for his original DIY effects. Soon you’ll be thinking differently about card effects with kids. There are 3 new card forces explained. The reverse count is my favorite and I will definitely use it. (With both volumes there are now 15 ways to force a card). The Kards with Art section is incredible. Barry gives away the art work and script for "Dead Eye Duck". This was one of Barry's earlier hits and many people paid retail for it. "Temple of Cows" is the art work and making use of his new temple screen with the production of 2 bottles from the center. The production of the first bottle will produce a groan from the audience but it's nicely placed. "Confused Animal" and "Art Wand" are fun tricks to make and perform but I really like the BIG ending with the Art Wand. (I will be adding this trick to my "All Smiles Extravaganza Preschool Magic Show") "Barrel Fishing" is my favorite trick on this DVD. I believe this will be the trick that has the ability for any magician to adapt to different themed shows. (I have written a similar but different script already using the concept and artwork) The last section, Kards With Objects is great. Barry shows how to make a mini version of his new temple Screen using top loaders (those are the plastic sleeves used to hold baseball cards) But the last effect on this DVD is Barry's favorite and may be mine as well after I make it. It is called "Elephant Castle" It is a DIY project making your card castle. But the front side in genius and the reverse is stunning. It will take some time to build one (or more, using different endings) For a Bible story ending, there is enough room on the back to draw an Ark with all the animals heads coming out the window, but having a chosen animal standing on the top of the Ark with a star burst behind it, or a light coming down from Heaven to signify it is the chosen animal. Great addition to Volume 1 and these both should be in everyone's library.